On 18th September there was a great turnout at the Harvest Supper. A lovely buffet was laid on by the church committee, enjoyed by all and fantastic value. Afterwards David entertained us as auctioneer, getting good prices for the local produce on offer. Many items were hotly contested. Follow this link to see all the photos. On the 4th of March 2013 we had a talk by John Butcher of United Utilities on the Thirlmere Aquaduct, which flows through Hutton Roof. It was a most interesting talk and slide show, and there was also a display of original maps and plans of the scheme. In addition, locals had brought lots of photos and other historic documents covering the local history of the area. Refreshments were served, including home made cake naturally. On 24th Feb 2013 we had our first Folk Night with Live Music, cottage pie supper and bar! 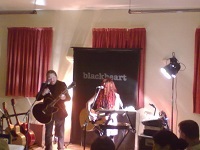 Live entertainment was provided by Blackheart folk duo : an all-acoustic modern folk duo, who have toured extensively in the UK. According to the BBC, Blackheart are “Taking the acoustic scene by storm.” Radio 2’s Aled Jones pronounced them “A great band.” Good Morning TV described their music as “Beautiful”. It was the first time we have held such an event and we were worried we would make a loss, but it was a great success. We had a bar for the first time and delicious home made cottage pie in the interval. 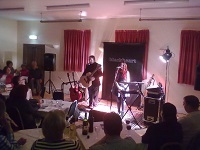 The hall was full, all seated at tables and it was a great atmosphere, great sound, great music, a great band! They are playing other village halls so look out for them. We all had a fantastic time and now plan to have more live music in the future. On 9th Feb 2013 we held the village spring social, incorporating a craft and photo competition with a theme of "Village Life". There was a fantastic display of photos of local life and of many other parts of the world. There was also a great range of craft entries from needlework to a stags head made from recycled objects! As usual the cooks on the committee did a great selection of food with a choice of 5 warming main courses and a lovely spread of puds. Seconds were available for anyone who could manage it! On Friday 29th April 2011 over 85 people headed to the village hall for a free BBQ and Royal Wedding Party. The fun started after the wedding at around 4pm. Everyone brought wonderful puddings or salads to share and whatever they wanted to cook on the BBQ. The prize for the most royal pud was won by Alison Newton. Loads of pictures appeared in the Westmorland Gazette, thanks to Vic Brown for sending in the ones shown here. Great fun was had with the wedding year quiz where you had to guess the year of about 30 wedding pictures supplied by the villagers , some featuring themselves, some royalty and some of ancestors from the recent and distant past. On Wednesday 27th June 2007 there was a wild flower walk over the crag led by Andew Walter (Wal) of the Cumbria Wildlife Trust. It was a beautiful evening and the walk was enjoyed by about 25 people of all ages. We all learned a lot about this area that we thought we knew well! We saw many rare plants that this area is famous for including Maidenhair Spleenwort, Limestone Fern Polypody and Limestone Bedstraw. Wal also explained to us the management regime for the area by Cumbria Wildlife Trust. He is currently using a special "Bracken Bruiser" machine to flatten down bracken where possible. The bracken is very invasive and we are all encouraged to trample it whenever we can, especially at this time of year. Wal will also be letting us know when there are working parties so we can join them. Cumbria Wildlife Trust Hutton Roof Crag Web page. We would like thank all those who donated so generously to the Carol Singers in Hutton Roof and Newbiggin. We raised £236 which will be split between Kendal Mountain Rescue and St Johns Hospice Day Unit. Tuesday 19th December 2006 Christmas Carol Service. A lovely service of carols and readings and the fantastic Kirkby Lonsdale Brass Band. 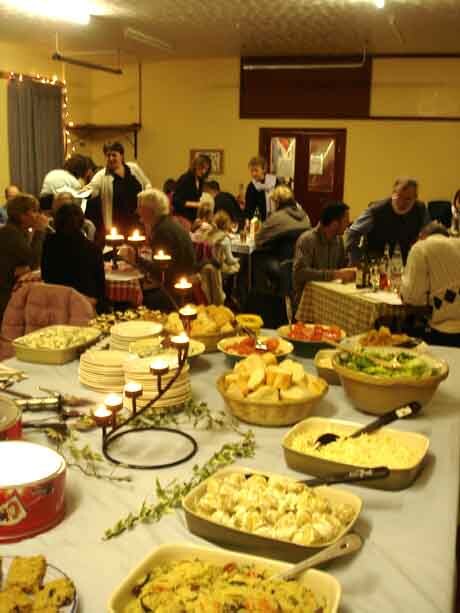 About 80 people came to the service and enjoyed refreshments in the village hall afterwards. Held at the village hall. 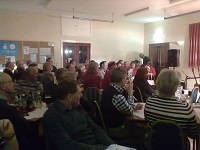 It was a great night enjoyed by over 60 preople. Thanks must go to Hilary Bull for the catering and all her helpers. Also many thanks to everyone who brought food and donated items for the auction – items from a (“locally grown”, “organic”) grapefruit to a hazel tree - were all purchased with very generous bids. On Saturday 27th May we had the 21st Fell Race and Country Fair. Also the church was celebrating its 125 year anniversary. It was a brilliant day - despite an odd heavy shower. Email me photos and stories you would like to appear. Read the newspaper report . See photos so far. On Saturday May 6th 2006 the Souper Pudding Evening was held. It was a very enjoyable evening with 5 lovely soups and many, many puds both hot and cold! As usual the food was excellent, and we all ate too much ofcourse! Hilary and Elizabeth prepared a food quiz, which was quite a challenge at the end of the evening. Cynthia's team and Jacky shared the honours. On Sunday 23rd April 2006 there was a walk over the Fell Race route. It was a beautiful day and the walk was enjoyed by everyone. This event was also very popular last year and looks to becoming an annual event in its own right. On Sunday 5th March 2006, the Rev Canon Graham Bettridge conducted his final Hutton Roof service. He will retire on the 1st April 2006 after 25 years with the Rainbow Parish. The Canon gave a wonderful and descriptive homily on this, the first Sunday of Lent, urging one and all to prune our lives of useless trivia, just as we prune our gardens. He spoke movingly of his 25 years in the Rainbow parish, and how he considered St. John's to be the jewel in the crown because of T.B. Hardy. He recalled the time he joined the people of Hutton Roof on their visit to T.B.Hardy's grave in Rouen several years ago. He hoped many people from the village would be able to attend his leaving "do" at the end of March to be held in QE school. All the congregation celebrated the occasion with a drink after the service when tea and gorgeous home made biscuits were served by the congregation. 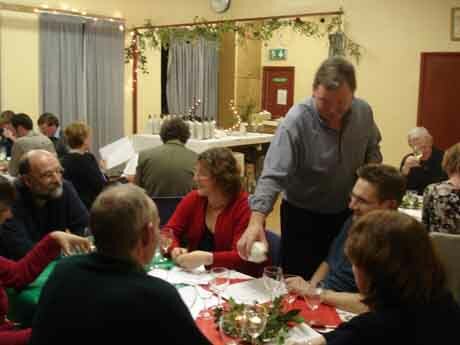 On 6th Feb 2006 the Social Evening and Quiz was enjoyed by about 45 villagers and guests. This was rather more than had booked - but luckily there was plenty of food for all. As usual the quality and variety of the food produced by the villagers was wonderful, and we all enjoyed seconds, thirds etc! A lot of work had also gone into producing 6 different quizzes. We all enjoyed doing them and all learned a lot in the process - particularly about Hutton Roof and Newbiggin. The star quiz was Ian Gibson's - 50(!) photos of odd corners and obscure features of the area - but some high scores were achieved. On 23rd December 2005 Father Christmas, laden down with presents, paid a visit to a big turnout of youngsters at the village hall. Apart from the present giving the children also enjoyed party games and food and the adults enjoyed it all too! December 2005 Oddbins Wine Tasting Evening was thoroughly enjoyed by all. If you would like to add more to this report please send me details. A group of 17 villagers attended an evening of moth spotting in Park Wood led by Rob Petley-Jones from English Nature and other experts from Cumbria Wildlife Trust. The experts who supplied a wealth of information about lifecycles, habitats and rarity, etc. of moths. There were some beautiful moths about that night including Brimstone, Emerald Green, July High Flyer and many more (detailed list to be added). All moths were set free after identification. Thanks to the experts for a fascinating evening. On 24th April 05 a group of villagers took a leisurely walk around the fell race route taking about three and a half hours. The runners do it in about 45 minutes! The view from the top of Farleton Knott is fantastic, with a glimpse of the sea and the Lakeland Fells in the distance. It was a glorious day, the views were spectacular. An impromptu BBQ at Hil & Phil's rounded off the day nicely. A formal dinner with after dinner speaker was enjoyed by fifty villagers and invited friends and families from Hutton Roof and Newbiggin on Friday 25th February 05. Guests were greeted with a complementary damson gin and tonic aperitif followed by a three course meal using traditional recipes and ingredients supplied locally. There was also a raffle and games throughout the evening which raised in total approximately £500 towards the cost of new disabled toilet facilities.